I have not used this backup before and I’m not an SQL Admin. The trial is installed and I’ve configured connection to the db as a domain admin as well as sa. In both connections, the software backs up the db successfully every time to either a local folder or a network folder. It fails on every scheduled backup. Backup of transaction logs also fails every time. What am I missing to get this working on scheduled backups? •	6:15:00 PM : ERROR: Failed to backup “master” database with “Full” backup type: One or more errors occurred. > BACKUP DATABASE permission denied in database ‘master’. BACKUP DATABASE is terminating abnormally. •	6:15:00 PM : ERROR: Failed to backup “msdb” database with “Full” backup type: One or more errors occurred. > BACKUP DATABASE permission denied in database ‘msdb’. BACKUP DATABASE is terminating abnormally. •	1:45:01 PM : ERROR: Skipping “msdb” database backup. Reason: [DBMS:11002#0] Transaction Log backup is not allowed for “msdb” database while the recovery model is SIMPLE. Use FULL backups only or change the recovery mode. >BACKUP DATABASE permission denied in database ‘master’. BACKUP DATABASE is terminating abnormally. This is a user permission issue. 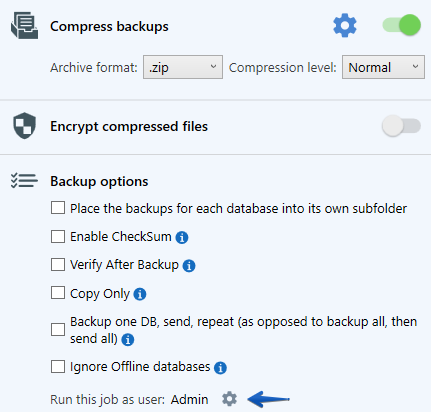 Could you please make sure that the user from behalf whom you run SQLBackupAndFTP backup job has all permission to backup your “master” database. You can find more details about this issue on the web. Also you can change the user from behalf you run SQLBackupAndFTP backup job at the “Backup options” if you use SQL Server Authentication method at the connection window. > ERROR: Skipping “msdb” database backup. Reason: [DBMS:11002#0] Transaction Log backup is not allowed for “msdb” database while the recovery model is SIMPLE. Use FULL backups only or change the recovery mode. To perform transaction log backups for your databases please make sure that your databases are in full or bulk-logged recovery model. Msdb database can be only in simple recovery model. Even though you change the recovery model of the msdb database to “Full”, it will automatically be reset to “Simple” the next time that SQL Server Agent is restarted. This is by design to prevent the msdb transaction from growing to an unmanageable size. You will need to perform only full database backups on the msdb database.